For the first time, scientists have used a satellite to estimate how much methane is seeping into the atmosphere from Arctic lakes. Preliminary data presented this week at a meeting of the American Geophysical Union in Washington DC help to explain long-standing discrepancies between estimates of methane emissions from atmospheric measurements and data collected at individual lakes. As icy permafrost melts to form lakes, microbes break down organic matter in the thawing ground beneath the water and release methane, a potent greenhouse gas. Researchers have measured the amount of methane seeping out of hundreds of lakes, one by one, but estimating emissions across the Arctic remains a challenge. Understanding how much methane is being released by these lakes is crucial to predicting how much permafrost emissions could exacerbate future climate change. In an effort to solve this problem, a team led by Melanie Engram, a remote-sensing scientist at the University of Alaska Fairbanks, turned to the synthetic-aperture radar measurements taken by Japan’s Advanced Land Observing Satellite. This type of radar measures changes in ground height. The team compared the satellite data with field measurements of methane at 48 lakes, and then used the correlations they found to analyse emissions at more than 5,000 lakes in 5 regions across Alaska. “For the first time, we can move up from a handful of lakes and look across the landscape,” says Katey Walter Anthony, a biogeochemist at the University of Alaska Fairbanks, who helped to conduct the research. Finding better tools to estimate Arctic methane emissions will help scientists to bridge data gaps and improve projections from climate models, says Clayton Elder, a biogeochemist at NASA’s Jet Propulsion Laboratory in Pasadena, California. Elder presented new findings at the meeting from a high-resolution airborne sensor that NASA has deployed as part of a decade-long field campaign to assess how climate change is affecting the Arctic. 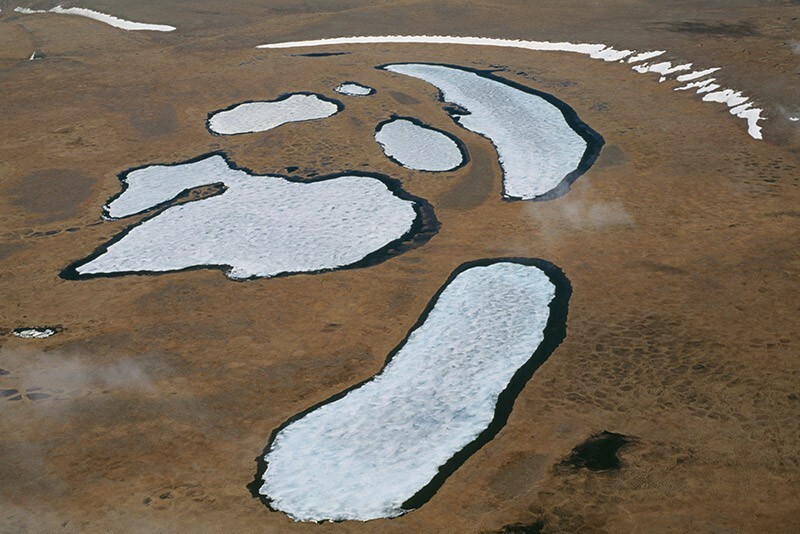 The data indicate that, across the region, much of the methane emitted by thawing permafrost on land comes from hot spots that surround Arctic lakes. And Engram’s results suggest that previous research over-estimated how much methane was coming from many large lakes, partly because scientists have spent more time studying smaller lakes with relatively high emissions. Previous modelling research by Walter Anthony and other scientists1 suggests that methane emissions from the formation of Arctic lakes could rise significantly as the planet warms during this century. The work, which assumes moderate global warming, projects that a spike in the amount of methane bubbling up in Arctic lakes would nearly triple the total emissions from permafrost — to the equivalent of nearly 19 billion tonnes of carbon dioxide, or roughly half a year’s worth of global CO2 emissions from industry. Anthony, K. W. et al. Nature Commun. 9, 3262 (2018).